A simple collage for little ones. 1. Gather your material. 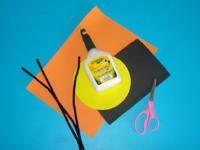 You will need orange Fun Foam, a yellow Fun Foam circle, a piece of black Fun Foam, three black pipe cleaners, scissors, and white glue. 2. 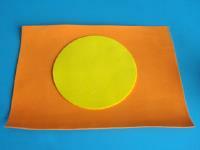 Glue the yellow Fun Foam circle in the centre of the sheet of orange Fun Foam to represent the sun. 3. 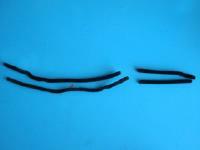 Cut two pipe cleaners approximately 2/3 from the end as shown. 4. Twist the bottom part of the two longer pipe cleaner pieces together to create a tree trunk with branches in the upper portion. Twist the two cut pipe cleaner pieces around the first ones to create additional branches. 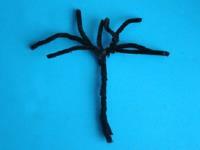 Cut the third pipe cleaner into three or four pieces to complete your tree. 5. 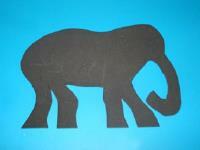 Using a model if you wish, draw an elephant silhouette on the black Fun Foam and cut it out. 6. 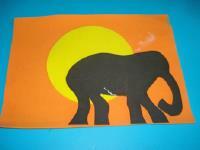 Glue the elephant at the bottom of your sunset scene, to the right. 7. Next, glue the tree trunk next to the elephant silhouette. 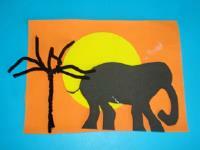 Avoid gluing the branches so that they stand out, giving your collage a three-dimensional look. Note: With very young children, you can prepare all the pieces ahead of time and simply let them glue them in place.